More than 5,500 employees from nonprofits throughout the state participated in the project. 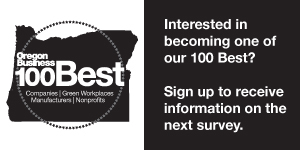 Based on the magazine’s widely regarded 100 Best Companies project, the nonprofit version was created to recognize a critical business sector that employs hundreds of thousands of workers. About 425 people turned out for the 100 Best nonprofits awards dinner and celebration. Anne Kubisch, president of the Ford Family Foundation, delivered the keynote speech. OPB Weekend Edition John Sepulvado served as emcee.